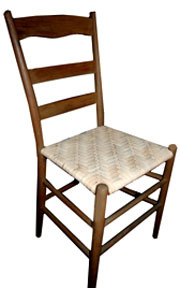 Choosing your chair caning and seatweaving supplies is the first step in restoring your chair to its former glory. 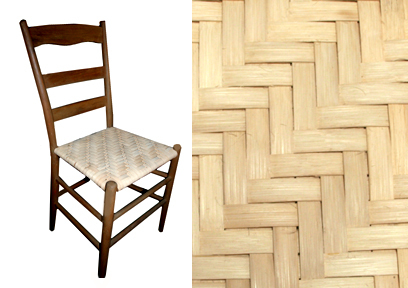 This page has chair seatweaving supplies info for cane, reed, fiber rush and more. Scroll down till you find your chair type. How to Choose What Kind of Materials you need for your chair. Please note: The illustration at left, shows drilled holes.The one at right, shows a groove. They’re not the same illustration. Two different kinds of caning. Please match to your chair type. Buy chair cane and a Chair Caning booklet, with completely illustrated how-to’s. Get this booklet when you’re weaving a seat with drilled holes in frame. OR, buy a Chair Cane Kit to get everything you need for one chair with Drilled Holes. 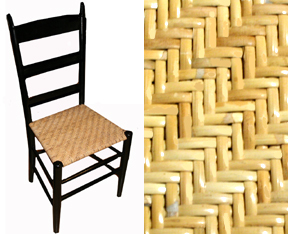 Use Pre-woven cane webbing for chair seats (shown in traditional hexagonal openwork pattern) for chairs that have a groove around the perimeter of the chair, as shown at left.When you buy the cane webbing at seatweaving.com, we include free instructions to show you how to install this easy-to-work-with cane. Go to our Cane Webbing page to learn what you need before you go to the Online Store. We also have a KIT for cane webbing– easy to purchase when you only need enough for 1 chair. It includes cane webbing, wedges and spline plus easy instructions. Does your chair have “rails” or “dowels” around the seat? If your chair is this style, you can use reed, binder cane, ash or fiber rush. 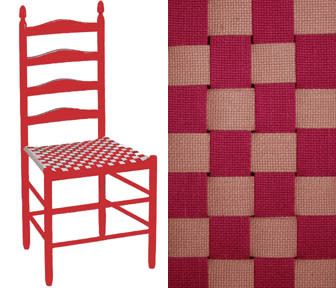 Below, see 6 examples of chair weaving styles and materials for chairs with dowel or rung construction. before your weave the seat. Weaving the seat is the last step in finishing the chair. 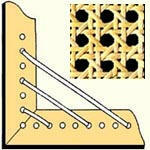 These are some of the patterns you can use for seat weaving chairs with “rails”. Finger Lakes Fan Weave booklet, completely illustrated how-to’s. Suitable for porch chairs, dining room chairs. Use wide binder cane or 3/16 to 1/4 flat oval. Or, one 500′ hank of wide binder cane in your choice of 4mm, 5mm or 6mm widths. New England Porchweave booklet, completely illustrated how-to’s. 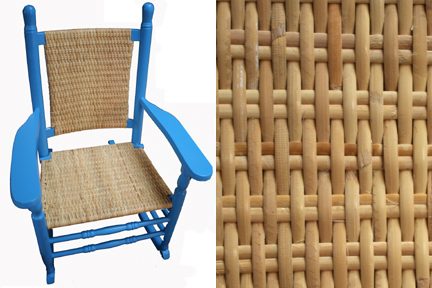 Get this booklet when re-weaving a porch rocker type in plain-weave with Wide Binding Cane or narrow flat reeds. If the weavers are narrow, 3/16″ or 1/4″ and have a shiny, bark-like appearance, that’s binder cane. Porch-weave pattern is best for this. It comes in 4 mm, 5 mm and 6 mm widths. 1 hank of binder cane is needed for the seat. 2 coils or hanks for the back.1/4″ flat reed can also be used (3 lb), but it will not be suitable for outdoors. Splint Weaving booklet, completely illustrated how-to’s. 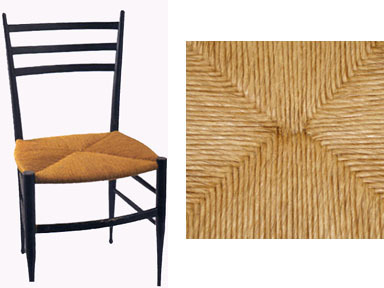 Get this booklet for re-weaving chairs in herringbone pattern with 1/2″ flat reeds or 1/2″ ash. The pattern is herringbone. You can also use 3/8″ flat reed, 5/8″ flat reed or 1″ ash. 1 to 2 pounds of 1/2″ (or 3/8″ or 5/8″) flat reed will weave this seat. Or, 90′ of 1″ wide ash. If your chair has a woven BACK, double the amount of the seat material to have enough for both. Fiber Rush Seatweaving booklet, completely illustrated how-to’s. Get this booklet for fiber rush seatweaving in the pattern at left. Also has all instructions to adjust for chairseats that are not perfect squares.If you want a twisted paper appearance, it’s fiber rush you need. If you want a twisted grass, it’s seagrass that you need. Neither is suitable for outdoors.See chair below in fiber rush. One 2 lb coil will weave this kind of seat. Herringbone Weave booklet, completely illustrated how-to’s. Suitable for all Binder Cane widths, and Flat Oval reed in 3/16″ or 1/4″ width. Use 1 hank, coil or pound for one seat. Also called “twill weave” in some parts of the US. 1. Measure the front rail between the posts in inches.2. Measure from the center of the back rail to the center of the front rail in inches. 4. Divide the resulting figure by 9 if you’re using 1″ tape. Or, divide the resulting figure by 5.3 for 5/8″ tape. Answer is the number of Yards needed per chair. 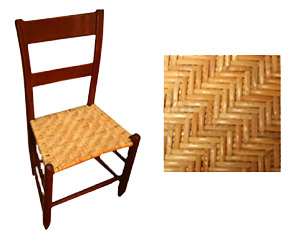 Kennedy Rockers use the New England Porchweave booklet & three coils of 6 mm Binder Cane to weave seat & back.